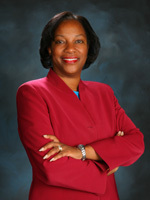 Michele Beal Bagneris, Esq. is the City Attorney/City Prosecutor for the City of Pasadena, California. She is responsible for managing all civil and criminal legal matters for the city. She and her staff advise the city council, city advisory bodies, commissions and committees, city departments, the Rose Bowl Operating Company, the Pasadena Convention Center, and the Pasadena Community Access Corporation. As City Prosecutor, she oversees prosecution of misdemeanor and infraction violations, and special programs such as the Truancy, Nuisance Abatement and Domestic Violence programs. She supervises approximately 30 employees in the civil and criminal divisions of the department and manages all litigation and transactional matters handled by in-house and outside lawyers. The Office of the City Attorney / City Prosecutor represents the City of Pasadena and works to arrive at creative solutions, which effectively address issues affecting residents and businesses in the City and assure that the public interest is well served in the areas of civil representation and criminal prosecution. Virtually every program and service offered by the City depends upon support from this department in its establishment, development and operation. Does the City Attorney’s Office advise citizens in legal matters? No. The City Attorney’s Office represents the city of Pasadena as a municipal entity. This office does not give legal advice to or represent individual citizens, or represent them in private legal disputes. What is the difference between a “public nuisance” and a “private nuisance” and when does the City Attorney’s Office become involved? A “private nuisance” is generally considered to be something that affects a single individual or a number of individuals with regard to a private right not enjoyed by the public at large. Various City departments and divisions may investigate allegations of public nuisance, depending on the nature of the issue, including Enforcement Services, Building Safety, Public Works, Fire and Police. These City departments will then work with the City Attorney’s office to protect the public health, safety and welfare of the community by taking legal action where warranted. The City Attorney’s office does not become involved in private nuisances, in which case the parties should seek private counsel. What is the difference between the City Attorney’s Office and the District Attorney’s Office? The District Attorney’s Office is a department of the County of Los Angeles. It engages in criminal prosecution of misdemeanor and felony crimes that occur in Los Angeles County. In Pasadena, the City Attorney’s Office is responsible for prosecution of State and local misdemeanor crimes that occur within Pasadena, including violations of the Pasadena Municipal Code. What options do I have if I see violations in my community? Make contact with the responsible person. Describe your perception of the problem. Discuss how the problem affects you and possible solutions. Most people want to be good neighbors and are cooperative once the issue is brought to their attention. If you are not able to resolve the issue by discussing the matter with the responsible person, report the violation to City Enforcement Services, or Police Department, depending on the nature of the violation. Attend Neighborhood Watch or Homeowner’s Association Meetings. Get involved with solving the problem. Your participation in these types of organizations not only helps out your neighborhood, but also allows you to make a contribution to the overall health of the City. If you have additional questions please contact us using our contact form.